Lighthouse Yoga celebrates a new opening! There’s light at the end of the tunnel for Lighthouse Yoga. A lot of light, in fact. The beloved neighborhood yoga studio, which lost its lease at 4203 9th street last summer, has found a large, bright second story space at 502 Kennedy Street. It plans to re-open in March. Owner Julie Eisenberg says she worked with Uptown Main Street to secure the new location. The larger space will contain two studios, allowing Lighthouse Yoga to run two classes simultaneously. Eisenberg is hiring additional teachers to accommodate the studio’s expanded offerings. According to Eisenberg, Lighthouse Yoga is the only DC studio in DC that offers kundalini yoga. The studio will continue offering kundalini yoga, as well as hatha and flow classes. Eisenberg also plans to offer her space to other yoga studios who may need it for weekend trainings or events. The move marks the end of a year-long ordeal that began last February when the owner of 4203 9th Street, where Lighthouse Yoga had been leasing for almost five years, informed Eisenberg that he intended to sell. Eisenberg began looking for a new space nearby, but rents were too high for her to afford. Then, in August, the 4203 9th street building owner informed Eisenberg that he had found a buyer, and she had 35 days to vacate. Eisenberg called the prospective buyer’s real estate agent to negotiate, and it turned out the buyer had no idea that the building had an existing tenant. Eisenberg says she tried to negotiate with the buyer, but felt she was being jerked around. Meanwhile, the clock on her notice was ticking. 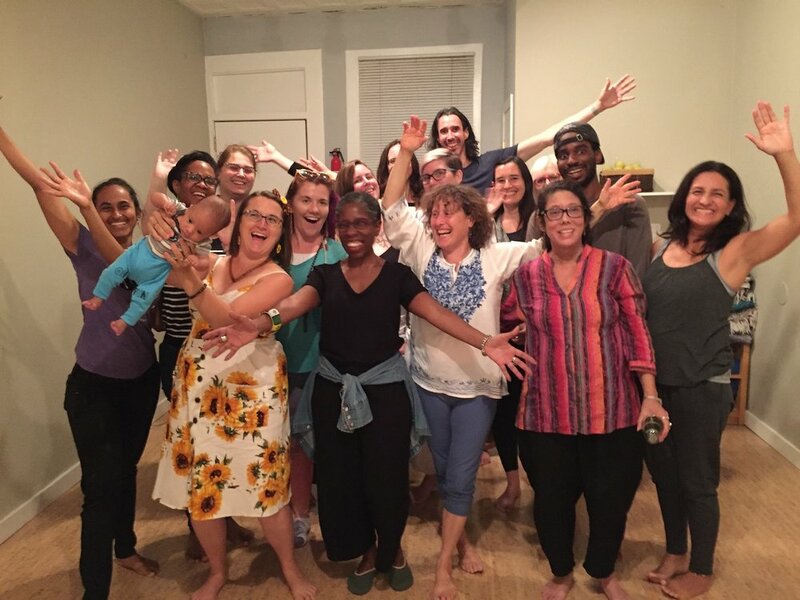 Luckily, the family behind Teatro de la Luna came to Lighthouse Yoga’s rescue; they offered to share their space, allowing Lighthouse Yoga to run classes two days a week as it searched for a new home. Then, in Mid-September, Eisenberg got a call from Jordan Haferbier, Executive Director of Uptown Main Street, an organization that supports local businesses. A space had come available on Kennedy Street, Haferbier said. Eisenberg was skeptical; she had seen so many spaces that she was starting to lose hope that she would find what she was looking part. While the move does put Eisenberg more than a mile north of her previous location, she says she is not worried about losing clients. In fact, Eisenberg says she had noticed the studio’s demographics shifting North and East over the last years, and so is hoping that the move will actually increase her client base. Eisenberg says that while she would have preferred not to have been displaced for five months, in the end things worked out for the best. There’s light at the end of the tunnel for Lighthouse Yoga. A lot of light, in fact. The beloved neighborhood yoga studio, which lost its lease at 4203 9th street last summer, has found a large, bright second story space at 502 Kennedy Street. It plans to re-open in March. When Lighthouse Yoga Center was notified by our landlord in August that we needed to be out of our space in 30 days, we were heartbroken. We’re Petworth’s only source for high-quality Hatha Yoga, and we’re DC’s only Kundalini Yoga studio. Closing the studio would present a big loss to Petworth’s quality of life. But our neighbors weren’t ready to let us go! Owner Julie Eisenberg sent an email to her clients today telling them about the upcoming closure and offering some alternative locations as she looks for a new place to call home for the studio. UPDATE: Lighthouse Yoga found a new home at Teatro de la Luna (4020 Georgia Ave NW). They’re seeking a permanent space. What’s with the buzz around Kundalini Yoga? You may have heard about Lighthouse Yoga Center’s Kundalini Yoga classes lately. The Washington Post featured it in an article "A lesser-known yoga style focused on internal health is gaining popularity in the U.S., some prominent Kundalini Yoga musicians have been in town lately, and the visibility of this ancient form of yoga has been growing quickly in recent years. But what is Kundalini Yoga? And why is DC’s only Kundalini Yoga studio based in Petworth? Most Fridays, my seven-month-old daughter and I walk south on 9th Street to Lighthouse Yoga Center to attend a Baby and Me Yoga class. Lately, babies are packed into the studio like gurgling, diapered sardines. And virtually every parent in the 17-member class calls Petworth home. There’s no question that these are stressful times. And one of the first things that goes by the wayside when we’re stressed is self-care. Lighthouse Yoga is offering some great sales for Small Business Saturday to help you find your inner peace and feel good. Petworth is a unique neighborhood in many ways: we have tree-lined streets, two of DC’s most beautiful Circles, a healthy mix of single-family homes and apartment buildings, and a great sense of community. But one of our most striking characteristics is that we have a host of wonderful local businesses, many of whose owners and employees live right here in Petworth. Yoga is not just a passing fad. According to a recent study, 36.7 million people in the United States already practice yoga, up from 20.4 million in 2012. That means that over 10% of the US population now already takes yoga classes (or practices at home), and another 24% have said that they are likely to start practicing in the coming year! Luckily, Petworth residents have an easy way to get started. Lighthouse Yoga Center, a small, community-oriented and locally-owned yoga studio located at 4203 9th Street NW, offers a 6-week course called Yoga Fundamentals that’s a great way to introduce you to the practice in a non-competitive and unintimidating way. Ed note: I'm pleased to present an article by Julie Eisenberg, owner of Lighthouse Yoga on 9th Street and a long-time sponsor and supporter of Petworth News. Julie wrote this sponsored article on behalf of her studio's latest yoga class for beginners, called "Yoga Fundamentals." Petworth News readers can save 10% off when you register with code PNews5 at checkout. If you can, now's a good time to donate food to those in need (anytime is a good time, actually). The Petworth Community Market (and other local businesses) are accepting non-perishable Thanksgiving-related food donations at their food donation bin this Saturday, November 14th. All proceeds support the Mary’s Center 2015 Thanksgiving Food Drive.